I had a little dance party when I realized I was packing my son’s lunch for the last time before winter break. And then I realized…I still have to make him a lunch every day. And entertain him. When’s mom’s winter break? We’ll be making trail mix pita pizza often, since it is so easy and a little bit different than regular ol’ PB&J! Plus, kids can top them all by themselves. So that makes a little less work for mom. My son doesn’t like pizza. We believe it’s a rare genetic defect. He came out pretty well otherwise, so I suppose I can overlook this strange gene mutation of his. But I like a challenge, so I often serve foods that sort of resemble pizza, in an attempt to get him closer to trying pizza. This is actually a dietitian “trick” called food chaining. You start with a food they like, and make a slight change to it, and slowly progress from there. So here we have something that is the same shape as pizza, served toasted, with peanut butter as the “tomato sauce” and strawberries as the “cheese.” Still a long way from pizza, but I got to call it “pizza,” so that is a win in my book. And that’s the story behind the trail mix pita pizza! Shaped like a pizza, yet otherwise not very similar to pizza. You can use any toppings you’d like, but this combo was fantastic! Toasting the strawberries on top enhanced their sweetness and made them more jam-like. Don’t skip something crunchy on top! An upgrade to the traditional PB&J, served pizza-style! 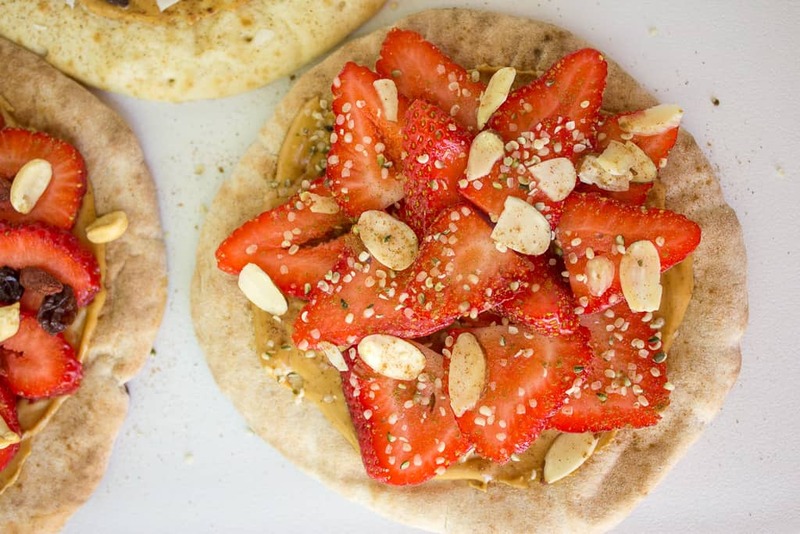 Top with sliced strawberries, hemp hearts, and sliced almonds. Toast lightly in the toaster oven. Slice into pizza wedges and serve. Use any trail mix toppings like raisins, dried fruit, nuts, or seeds. You can set out a few choices and let your little one top their “pizza” to make it their own! I compiled a TON of protein-packed kid-friendly recipes to try. You can see them here! We are also huge fans in our house of these bars. If you are a peanut butter fan, you will be too! Breakfast Menu Cards Are you ready for drama-free mornings with your toddler or preschooler?? Click here to download your free PDF! Connect with me on Instagram @mamaknows_nutrition!